OK – I can see how that might be fascinating, but what makes it profound? It’s all explained in the INTRO but here’s a little overview to give you an impression. Speech is all around us, all the time. Even when there’s no speech outside our heads, it can be hard to stop the chatter inside! It’s so familiar, we feel we know exactly what is like. And yet research in phonetics (the science of speech) has shown that speech is nothing like what most people think it is like. It turns out that much of what our society accepts as common knowledge about speech is wrong. Not just a little bit wrong about the odd technical detail, but deeply and significantly wrong about its nature, and how it works. Well yes, it is challenging – but in a good way. A profound way, in fact! Once you start to learn about the nature of speech and how it works, you realise the ‘secrets’ uncovered by phonetic science are actually hidden in plain view. They’re right there for any of us to experience and think about. We just let ourselves get so distracted by the false beliefs of common knowledge that we rarely notice the reality under our noses. And when we do, we don’t quite know how to think about it. Now do you want to know the most delightful thing of all? Behind the false beliefs of common knowledge, are deeper truths waiting for our discovery. And those deeper truths relate not just to the nature of speech, but to the nature of us, our minds and the world we live in – affecting our understanding of everything we think about and talk about. OK I’m intrigued. What do I do? Well ultimately you’ll need to join our UNLEARNING program. It’s a bit of a commitment (not too much, but a bit!) so you’ll want to check out our INTRO to be sure it’s right for you. In the meantime, here’s a taster to give you an impression of what Rethink Speech is like. Ever laughed at speech turned backwards? It sounds like a strange foreign language, possibly Martian. Now – have you ever laughed at writing turned backwards? Somehow not quite so funny, is it? So why is that? Why is backwards speech funny, while backwards writing is ho-hum? The answer tells us something pretty fundamental about the nature of speech. It also prompts us to think about what we mean by ‘backwards’. What if we turned speech backwards like this: sdrawkcab nettirw ecnetnes a s’ereH? Or like this: backwards written sentence a Here’s? Here’s a classic (from Felix Sputnik). At Rethink Speech, we love mondegreens (funny misheard song lyrics). And not just for their humour, great as that is. Even more for what they can tell us about the nature of speech – and the nature of our minds (Hint: there’s more to it than our ‘biased’ brains playing tricks on us!). Rethink Speech has a whole module on mondegreens that will surprise you even if you know a lot about mondegreens. We actually develop a whole theory of speech called Mondegreen Theory! Want to speak like a rainbow? Turns out, you do! The rainbow is a sequence of 7 colours, right? Well, sort of right. 7 colours is how we think about speech. The real rainbow is a continuous gradation of colour. The word ‘rainbow’ is a sequence of 7 sounds, right? Turns out that’s only sort of right too. We think about it as 7 sounds. In reality it’s a continuous gradation of sound. Interestingly though, it’s a lot harder to notice the continuous nature of speech than the continuous nature of the rainbow. Why is that? Can you tell what these people are trying to say? Is ‘th’ really their main problem? Is teaching them ‘th’ the best help you could give? Rethinking speech can suggest a better way. Phonetics is a lot more interesting than you probably expect. And its findings have relevance in a lot more important domains than you might expect. 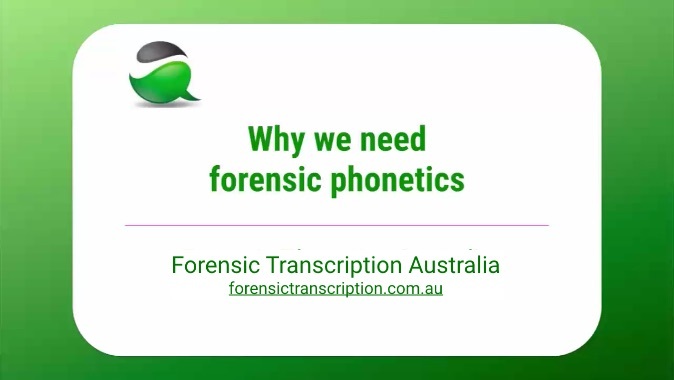 One of the areas Rethink Speech specialises in is Forensic Phonetics. The video gives a taste. Rethink Speech is as much about thinking as about speech. Investigating speech gives a fresh new perspective on how the mind works, with implications for how we understand our world and ourselves, and for how we live our lives. In today’s world, what could be more important than that? Right, where was I? I know I was about to do something before I got started on that taster! Be guided by the top menu. Get introduced to Rethink Speech by the INTRO, experience the EXPERIENCES, and learn a little about what Phonetics is (and isn’t). When you feel ready, check out the UNLEARNING modules. And keep in touch as you do so!